Our Review Board is now open. Submit your prose, poetry, or book today! Sometimes, writing a short story can be like going for a drive with no map: You have a solid starting point, but then the highway has multiple exits. Which direction will get you where you need to go? 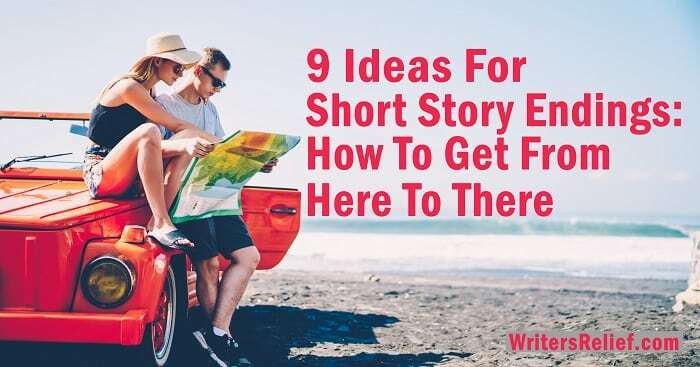 Time to whip out your virtual writing GPS and ask the Writer’s Relief experts for the best route to a great ending for your short story— you might see your narrative journey with new eyes! Indicate character change through action. If the arc of your story traces the evolution of your character’s emotional change, ending your story with a distinct choice or action can be a great show-don’t-tell way to imply development. Bonus points if your character’s decision/action is not one that he or she could have made at the beginning of your story. Show character stasis through inaction. Taking action or making a decision can demonstrate a character’s dramatic change, so failure to take action (or to make a new kind of decision) may indicate that your character has not grown as a person in spite of opportunities to do so. Kill someone. In some ways, death can be the ultimate ending of a short story. But keep in mind that if your story ends with a death, readers might feel exploited if that death has no thematic resonance with everything that came before. Welcome baby. Births are dramatic events. If the themes and explorations of your story are in line with concepts of expectation and birth, then a big, high-tension labor and delivery scene might make for a memorable closure of your tale. Of course, “quiet” births can also be emotionally engaging. Do the twist. It’s not easy to write a twist ending. But well-crafted surprise endings are not soon forgotten. Learn more about how to write a story with a twist ending. Leave the unanswered questions unanswered. Sometimes, you may not want to tie up your story’s loose ends in a traditional dénouement. If your interest in exploring a particular theme is less about answers and more about the journey, there may not be a need to embrace a traditional ending at all. Come on, get happy. In the world of literary fiction, straightforward happy endings are a rare phenomenon. But if your short story lends itself to a good happily ever after, then by all means enjoy riding off into the sunset of your narrative. Be a story mad scientist. One of the best things about being a writer is the challenge of inventing new ways to tell stories. Who says you have to do what’s expected? Your straightforward short story about a father contemplating the passing of time could turn into a wild alien invasion adventure. Or, your modern homemaker could be rescued from the drudgery of vacuuming by a deus ex machina. Have fun, take risks, and invite readers to come along for the ride. Go meta. Metafiction is difficult to define, but essentially it is a type of fiction that flaunts the author’s (or narrator’s) self-awareness of literary style and construction. Your short story might start out as traditional fiction, but who says it has to end that way? Your ending can draw your readers’ attention to the deliberate literary craft of your work as well as your intentions as an author—making your point by pointing to the fact that you’re making it. Flash fiction and slice-of-life vignettes don’t always require the traditional elements of narrative closure that are common to short stories. Readers who appreciate flash fiction and slice-of-life sketches are often expecting a quick peek into a new world—as opposed to a full exploration of it. Check out our best tips for crafting slice-of-life vignettes. Question: Which of the ending types above do you encounter most often in short stories (your own or stories written by others)? Of course, I love the last part. I wrote stories before and I usually end it with a question. It makes my readers hungry for more information; to the point that they will reread the story. Added best story writing strategies by choosing an idea. May it will help me more to select a topic for my new post.